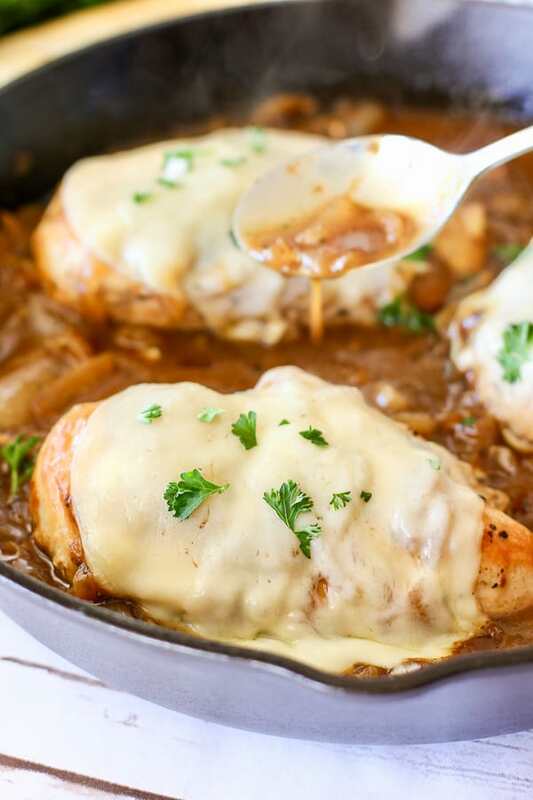 This French Onion Chicken dish is our new favorite easy dinner! 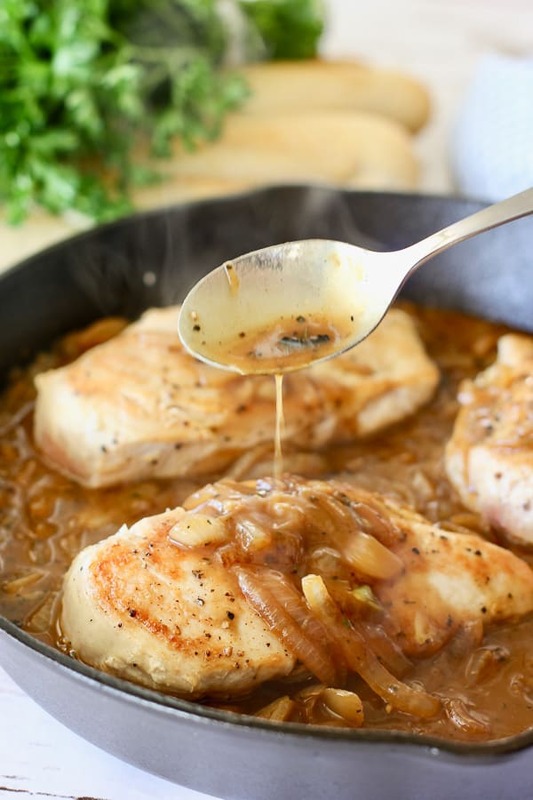 Simple seared chicken breasts with an easy to make pan sauce reminiscent of French Onion Soup! There are days I love my job and today is one of them! I whipped up this dish is no time flat and the flavors are simply amazing! Here is how I did it! So, ya know how we have talked about how to sear chicken without a mess? We are going to use that same technique here. So simple, so easy, and a lot less oil and mess! 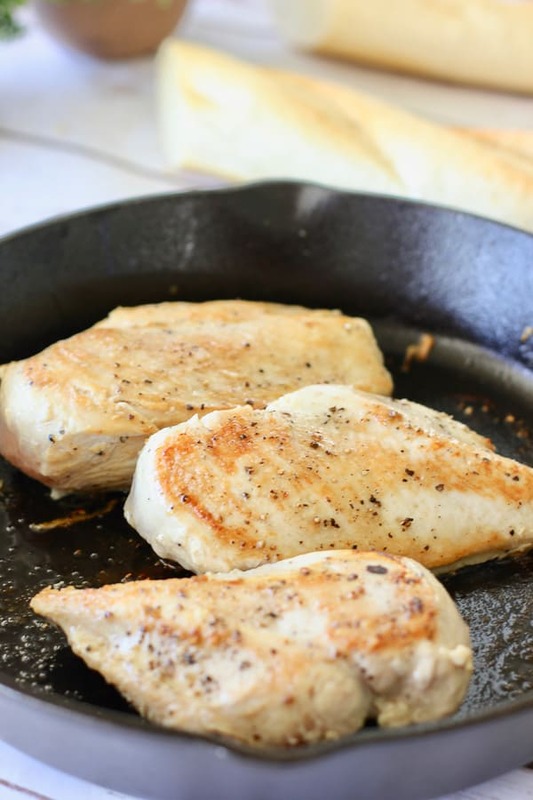 MASTER THIS EASY WAY TO SEAR CHICKEN (OR ANY PROTEIN) AND SAY BYE BY TO THAT MESSY STOVE TOP EXTRA OILY CHICKEN! No oil in the pan. Rub the chicken itself with the oil. Liberally salt and pepper. Place chicken in hot skillet. Don’t touch for at least 3-4 minutes. The chicken is smart, it will release from the pan when it is ready. If it doesn’t release, it’s still cookin’! Chicken is cooked perfectly at 165 degrees. I used my Lodge Cast Iron Skillet but any heavy duty skillet will work. 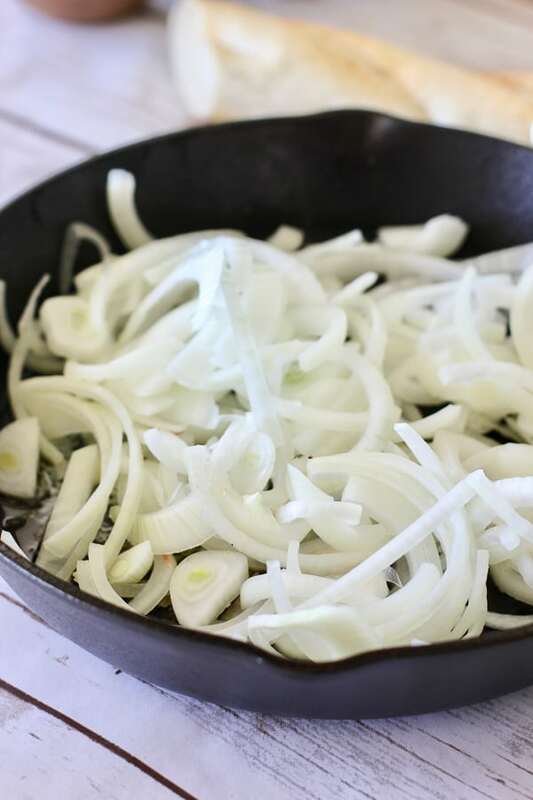 Cast iron is my go to pan when I want something seared perfectly or browned like these onions! Next, I chopped my onions in half and then in thin slices. Not a fan of big stringy onions so I stay away from using the full rings. You could just chop them too if you prefer bite size. There isn’t much to caramelizing onions. Cook in a bit of oil and butter and watch them turn into gold! Add a bit of flour and beef stock to your caramelized onions and you have the most delicious pan gravy and lots of it. We don’t skimp on the gravy around here! Your now into this for about 10-15 minutes and guess what? You are almost done! If you make this once, you will make it 100 times…okay maybe 50 times…such a food drama queen. Nestle the chicken back into the onion gravy. Those two words together, ‘nestle’ and ‘gravy’ make me soooo happy! Top with a bit of cheese. I used provolone but gruyere is more traditional. You can also sub swiss if thats what you have. 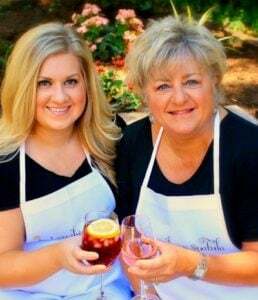 I guarantee ya there will be no on complaining on your cheese choice! We like to serve this with with a fresh baguette to soak up all those juices and a simple veggie like steamed broccoli…dinner done! This recipe does wonders with pork chops as well, or even ground beef or ground turkey patties, like a super easy Salisbury Steak! 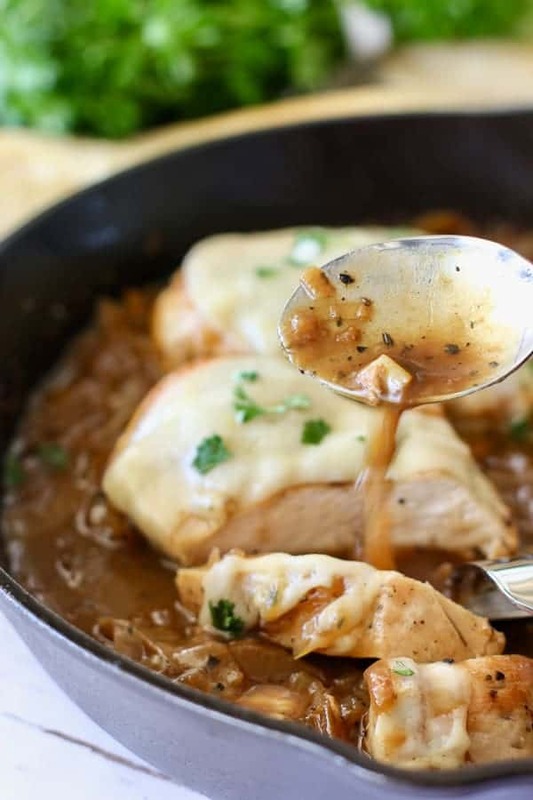 Check out this video to make your cooking of this French Onion Chicken easier! 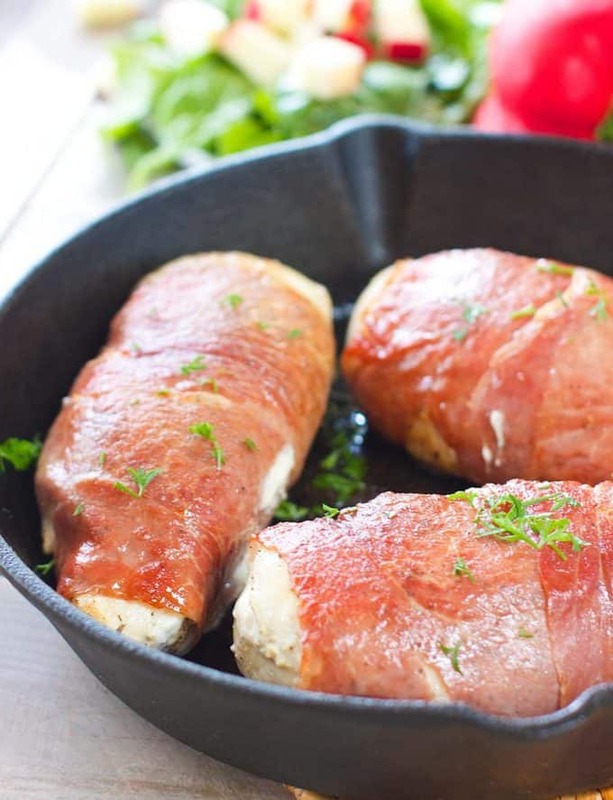 Prosciutto Wrapped Chicken Breasts stuffed with store bought herb cream cheese – 30 minute meal good enough for company! 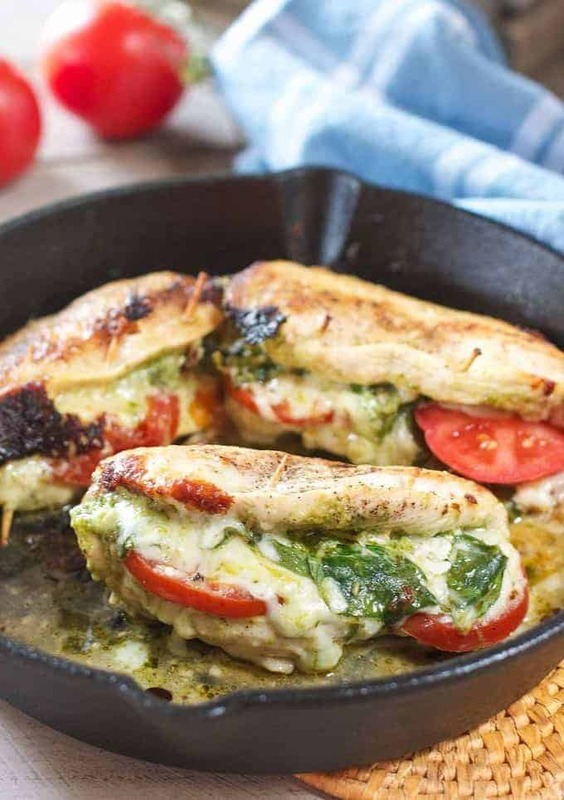 Or this Pesto, Tomato and Spinach Stuffed Chicken Breast – one of my personal favorites! To Easy Chicken Dinners and gravy…lots and lots of gravy! This simple one pan dish packs a ton of flavor! Reminiscent of french onion soup and made in about 30 minutes! Rub olive oil on chicken. Sprinkle liberally with salt and pepper (this helps develop a crust when searing). Place the chicken into the hot pan. No need to add oil to the pan. Cook for about 3-4 minutes on each side. Don't touch for a few minutes, let the sear develop. When chicken releases easily it is ready to flip. Sear on other side. Remove chicken from hot pan and set aside. Add butter and olive oil to pan. Add onions. Sprinkle with a big pinch of salt. 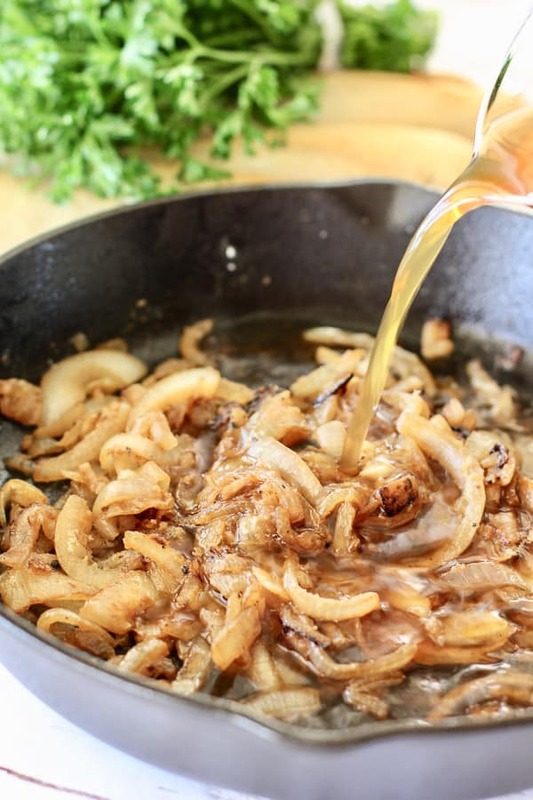 Sauté until onions are soft and deep caramel color. About 5-7 minutes. Add thyme. Sprinkle flour on top of onions and cook for one minute until no flour is visible. Add beef stock and Worcestershire. Simmer until thickened and bubbly, about 3-4 minutes. Nestle seared chicken into the onion mixture and spoon gravy over top. Cover and cook an additional 10 minutes or until internal temp of chicken reaches 165 degrees. Top with cheese, cover and allow cheese to melt. Serve with fresh steamed veggie like broccoli and a baguette of bread if desired. Sear chicken using our easy method. Less oil, less mess. Slice onions in half then into strips to avoid big stringy onions. Use provolone, gruyere or swiss for the cheese. Yum! This dish has so much flavor!! Can’t wait to try. Rubbing the chicken with oil is a great tip – I’m going to try that. 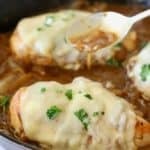 I love French Onion Soup so I know I’d love this French Onion Chicken! Thanks Jill! Once you try that method and see how less messy it is you will never go back! :). Great minds think alike ~ I’ve got this on my blogging schedule, but the first time I made it it didn’t turn out nearly as gorgeous as yours…it looks mouthwatering! High praise from one of my favorite bloggers! (you have a blogging schedule? Boy I need to do that! :). These are my favorite flavors together! I could eat french onion soup everyday in the winter – and with this recipe now I can get those flavors even more! Thank you Tracy! I hope you get a chance to try it! Such a great dish! 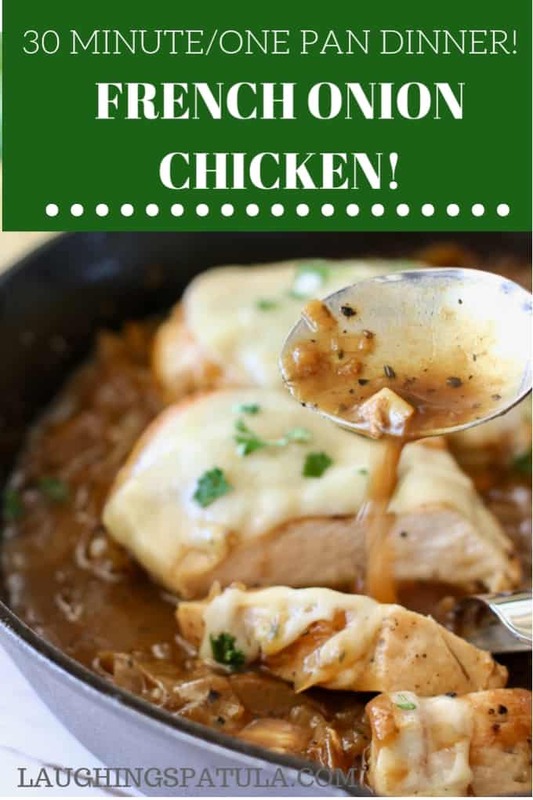 I’m always looking for new chicken recipes and this looks like a real winner!